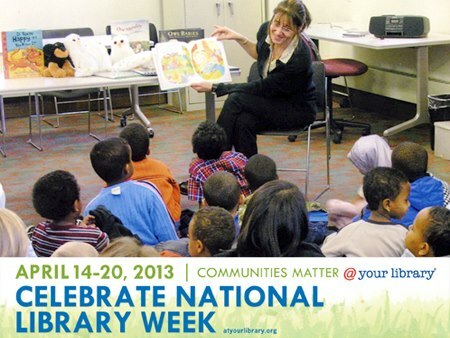 Happy National Library Week (April 14-20, 2013)! Check out your local library for ways to support and celebrate libraries in your community. In my introduction to library and information science class, I learned about the values enshrined in the Library Bill of Rights. The document was drafted by the professional organization for the field, the American Library Association (ALA), and first adopted in 1939 with periodic amendments throughout the end of the 20th century. The document embodies the ideals of intellectual freedom and equal access to information for all community members; these ideals are based on the reasoning that a democratic citizenry must be well-informed. Last year, during an informal get together to think about the intersection of librarianship and social work, I learned about the Code of Ethics of the National Association of Social Workers (NASW), which details the ethical behavior that social workers who are part of the professional organization must adhere to as representatives of their field. The code lays out the core values of the profession: service, social justice, dignity and worth of the person, importance of human relationships, integrity, and competence along with the related principles that social workers should embody. I’ve been thinking about these two documents as manifestations of how librarianship and social work are professions based in the public good and outside the calculus of market value. Yet, at least in librarianship, there has been a steady encroachment of market thinking into the way libraries are run–from the increasing expectations that libraries generate revenue to cover costs through add-on services like book and dvd rentals to the use of performance measures and rubrics that privilege efficiency and other values over the ones identified in the Library Bill of Rights. * I would like to think through these two documents in the coming months on this blog and invite others to share their thoughts as well. I will revisit these documents in more detail to explore their connections as well as what they might reveal about possible collaborations between professionals from the two fields, drawing on complementary training and strengths. During class discussion about the Library Bill of Rights, the professor mentioned an interesting detail about the document–that it focuses on the library as an institution rather than on librarians as the professionals who perform services. While this focus makes sense in some ways, as does the naming of the professional organization for the library rather than librarians, it has one side effect of de-emphasizing the people who protect intellectual freedom and provide equal access. In contrast, the Code of Ethics for the NASW is framed explicitly as guidelines for how social workers much enact their principles, including competencies that they must be able to demonstrate. What difference does this framing make for the way professionals in the fields relate to their core values? In What Money Can’t Buy: The Moral Limits of Markets (FSG, 2012), Michael J. Sandel argues that the importing of market logic into areas of life, society, and politics that traditionally have been governed by different values leads to the risk of degrading society’s morals. He argues not that market values are immoral in themselves but that when applied to certain things, there is a risk of corrupting how people view those things, as when people put a price on babies for adoption, women’s bodies to carry fetuses, and faster access to government services. ** While there is a lot of important discussion in the library world about how to make services more efficient and economical in order to continue providing services for the public good, these discussions often take for granted that economically difficult times means less money for public services rather than a questioning of larger economic processes that have eroded the availability of public funds in favor of privatized investments. What kinds of conversations can librarians and social workers foster in and between their fields to challenge the new public philosophy? Public libraries are rooted in the communities they serve and aim to respond to the needs and issues faced by individuals in those communities. How can social workers’ deep commitments to serving the needs of clients and valuing the dignity and human worth of people help librarians connect with the library community in more robust ways? How can social workers’ explicit articulation of a social justice philosophy enrich the Library Bill of Rights’ more implicit affirmation of social justice via noncensorship and nondiscrimination against users? Paul Lai is a graduate student in library and information science at Saint Catherine University with interests in scholarly communications, public library philosophy, special collections, and literacy dogs in libraries. He is a blogger at Hack Library School and also studies Asian American literature. * John Buschman’s Dismantling the Public Sphere: Situating and Sustaining Librarianship in the Age of the New Public Philosophy (Libraries Unlimited, 2003) offers an excellent discussion of how the last few decades in the United States have seen a marked dissolution of the boundaries between the market economy and the public sphere, to the detriment of the public good. Buschman’s thesis on the new public philosophy also appears in shortened form in “On Libraries and the Public Sphere,” Library Philosophy and Practice, 7.2 (2005). ** A shortened version of Sandel’s argument appears in “What Isn’t for Sale?,” The Atlantic (April 2012). I want first to respond to your observation/your professor’s observation on the Library BoR being aimed at the institution and not the practicing professionals. This is spot-on, but not the whole of the story. Without bombarding you with links or citations, I think my Academe article is helpful in thinking this through and cutting through some of the excuses (http://www.aaup.org/article/who-defends-intellectual-freedom-librarians#.UW7LPspXqSo). I’m glad you picked up on Sandel – his argument is a cogent one. He is part of a cluster of communitarian political theorists, and they have provided very important insights that have shifted thinking over the last few decades. Sandel’s formulation sums up one of the primary points: “we can know a good in common that we cannot know alone.” When they function well, libraries, schools and universities instantiate and form a kind of community – a good in common. Community in turn depends on and functions through trust, cooperation and mutual dependence – the opposite of neoliberalism. Maximally, community “denotes solidarity between persons united in their sense of belonging through a shared past and/or common goals” – like religion. I take a more modest view where libraries (and social work as a profession as well) fit more comfortably. A view of community that does not indulge in nostalgia acknowledges that people are likely unwilling to limit certain personal liberties to belong, and that the most practical contemporary place to enact a form of community is in institutions — like libraries. Otherwise, as it has been put, history simply does not support optimism that members of society with established roots will better tolerate the practices and preferences of minorities. Institutions – libraries, in my view, primary among them – are the places to enact a form of community and give people a foothold to resist neoliberalized visions of society through the helping professions like ours. Professions like librarianship and social work have an important place to work out the “grammar” (as Habermas calls it) of everyday life (the lifeworld) that is outside of the regime of neoliberalism’s logic. It seems small-ball, but it is important. Whitney Maxi, a community organizer in the Liberty City section of Miami recently, put a human face on the idea in an interview on the American Dream. The crash of 2008 was just a “deepening of the devastation” there. “The immediate goal,” she said, is to “create systems that are more humanizing to be in and having a say in what resources come in and out of the community. If there is an American Dream [here], it’s having a voice that’s heard and recognized as the authority for their area” (http://www.marketplace.org/topics/wealth-poverty/next-america/american-dream-liberty-city-miami). I think that’s as good a summation of non-neoliberal ideas of community and control and democratic functioning that there is, and we – both social work and librarianship – can play a meaningful role in those processes.